Spring is in the air, which means summer is right around the corner. In Phoenix that means it’s time to get to higher ground or the ocean. If you opt for the former then why not head two hours north and check out Jerome? Sure, there’s a “Main Street” area where all of the tourists hang out but if you follow the signs you can head a couple of miles outside of the crowds and explore what used to be Haynes, Arizona. 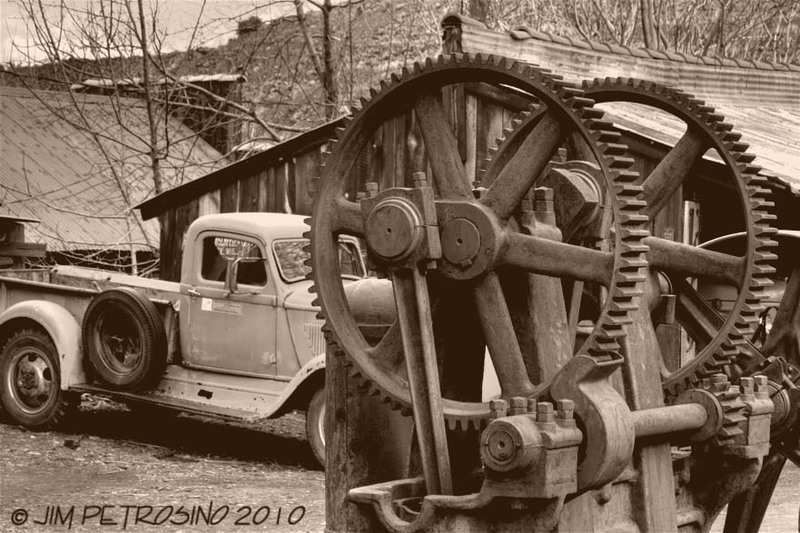 It is a privately owned attraction that features antique machinery and an abandoned mine. Some of this machinery works! That includes a 10,000 cubic inch engine which used to power a small town and a giant saw mill. There’s plenty of trucks, cars and tools lying in rust waiting for the owner Don Robertson to get around to fixing them up and turning them from rust buckets into show cars. In addition to the rusty metal items are some old wooden buildings. There is a dental office, a schoolhouse and even a bordello. None of them are still operating, but they are picturesque. If you have kids with you they will delight in feeding the animals at the petting zoo. Sodas and trinkets are available in the gift shop. This weekend I went to Sedona for a wedding. So, of course I took my cameras. I decided early on I was going to shoot it a bit differently than I normally do, this time. I set the trusty Canon to Aperture Priority and turned my Auto Exposure Bracketing on. Three shots, spaced between 1 and 2 stops apart. That was how I shot everything. Why? Well, Sedona is famous for its red rocks and blue skies. Since it had just rained, that meant lots of greens on top of the reds. Add to that some puffy white clouds and shadows and you have a lot of dynamic range to try and capture with a digital camera. I wanted to see if I could accurately capture all the mountain details without blowing out the sky or resorting to any camera filter other than the circular polarizer I brought along. Now, I’m not going into all the details of HDR (High Dynamic Range) photography, bracketing (AEB) or why the mountains are red. I’m just going to say it was a great time and share a couple of shots with you. If you have seen HDR before, you may be expecting to see really vivid, almost cartoonish colors here. You won’t. This is a real landscape and the bracketing and HDR composites have been made with that in mind. I wanted to show you that HDR doesn’t have to look surreal. It can be used to capture and display all the details your eyes see. As I mentioned, in Sedona that means lots of red, green and blue. It just so happens to be colors your camera is made to capture. The bracketing is perfect for sucking details back into the pictures.